Snow and little Noel were the best of friends, but their futures were dismal as they awaited slaughter on a dog meat farm in South Korea. Luckily, amazing rescuers from Humane Society International (HSI) stepped in to save dozens of these incredible four-legged pups, including Snow and Noel. According to HSI, dogs on meat farms are often left loose since farmers know that they won’t wander away. Snow was chained up, but his best friend, Noel, wouldn’t leave his side even though he could have made a run for it. When HSI stepped in, neither of these two best buddies knew whether or not they would ever see each other again. As seen in the video, when these two finally reached safety after their long trip to the United States, the happiest pup reunion ever happened. The pair will go to the Washington Humane Society together. So many dogs are still suffering as victims of the dog meat trade. To learn more about how you can help, check out Humane Society International’s website. Snow & Noel Reuinted in the U.S.
Puppies on dog meat farms are often left loose because the farmers know they won't wander away. Snow was chained up, but little Noel stuck by her. 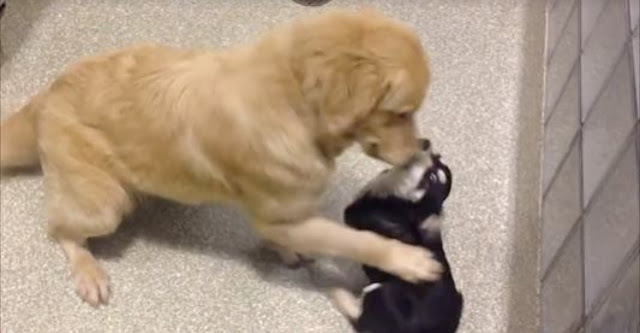 Watch these two best friends be reunited after their long trip to the U.S. Responses to "Best Buddies Rescued From Dog Meat Farm Have Happiest Reunion Ever "